One of the most powerful survival strategies in nature is the ability for certain animals to be poisonous or venomous. Both of these employ chemicals that make the creature toxic to others. Poisonous creatures generally use their toxins in a defensive nature- for example, many toads secrete toxins and are harmful when consumed. Venomous creatures, on the other hand, inject their toxins through bites or stings. These toxins can be very effective at distracting, disabling, or even killing the victim. Because of this effectiveness, these creatures are usually avoided by predators that are in search of easy prey. Some poisonous and venomous creatures have developed distinct colorations that help them in displaying their toxic talents. Poison dart frogs, lionfish, coral snakes, and black widow spiders are among the animals that have colorations designed to stand out from the landscape and other animals. In many situations, simply displaying these colors is enough to scare away most predators. This immediate defense is powerful enough to attract the attention of creatures also looking for a way to defend themselves. Wherever there are populations of poisonous or venomous animals with distinct warning colorations, there are probably also creatures that mimic those colors. These nontoxic doppelgangers adopt the colors and forms of their target to an impressive degree. One of the best ways to observe this type of mimicry, known as Batesian mimicry, is actually in and around your backyard this growing season. Although primarily only used in defense, bees and wasps are well known for their painful and unpleasant stings. A good deal of our native bees and wasps have developed distinct warning markings involving stripes of blacks and yellows. You may be surprised to find that many of the yellow and black striped insects you see outside are in fact not bees or wasps, however. Many other insects have caught on to these warning signs and have adapted disguises of their own. Some of the major bee mimics are actually flies. Hoverflies commonly mimic both bees and wasps and can be seen flitting among blooms as they feed on nectar as adults. They don’t eat nectar during their entire lives, though. The young of many hoverflies actually chow down on aphids and are a huge boon to the garden. Hoverflies search for large groups of aphids and lay their eggs nearby. Some orchids actually mimic the scent of aphid congregations in order to attract hoverflies! 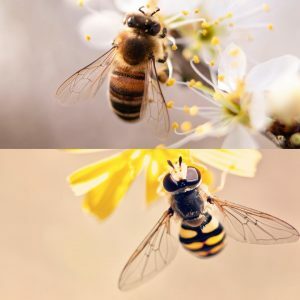 There are many types of mimic flies, and while they don’t all provide the added benefit of pest control, the pollination they provide is thought to be second only to bees. These garden mimics can usually be told apart from the real thing through a close inspection- mimic flies have only two wings compared to the 4 that bees and wasps pack. Flies also generally have larger eyes and lack the hairs that bees possess. Another rare and interesting garden mimic is the fast-flying clearwing moth. Also known as a hummingbird moth, this creature looks like a mix between a miniature hummingbird and a fuzzy crawfish with wings. 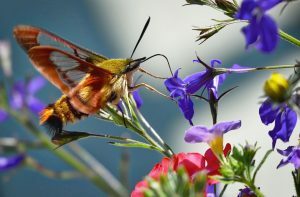 There are two species of clearwing moth native to the states, one which takes on the appearance of a hummingbird while the other tends to look more like a bumblebee. Both of these disguises serve to distract potential predators long enough for this agile moth to make an escape. Keep an eye out around viburnums and honeysuckles for a chance to see them as they zoom by. Please note: mimic flies and hummingbird moths are extremely sensitive to pesticides. If you do not see these creatures and routinely spray pesticides, you might be surprised at what visits once you slow or stop the applications. This article was originally published in The Sylva Herald.